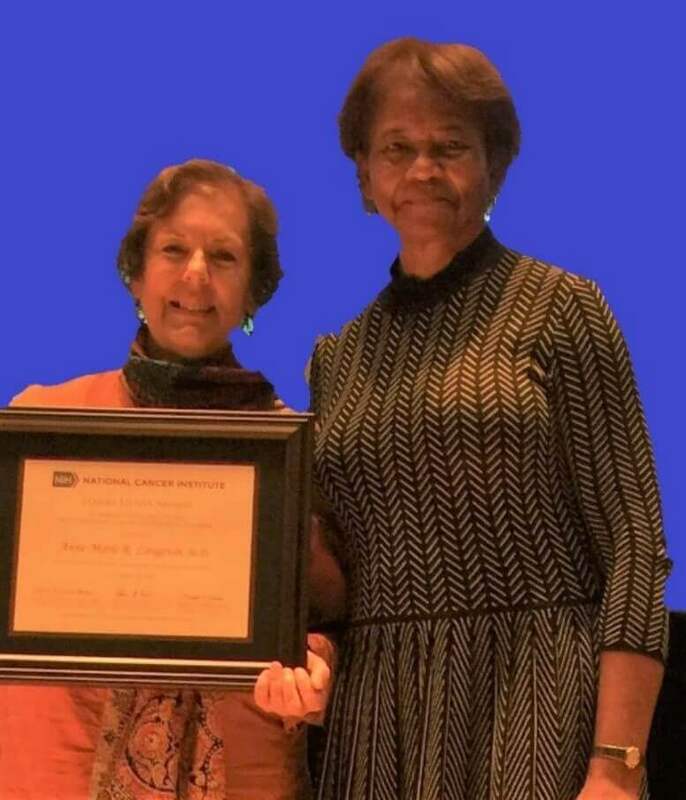 Harry Hynes 2018 Awardee Anne-Marie Langevin of the South Texas Pediatric M/U NCORP, left, with NCORP Director Worta McCaskill-Stevens. 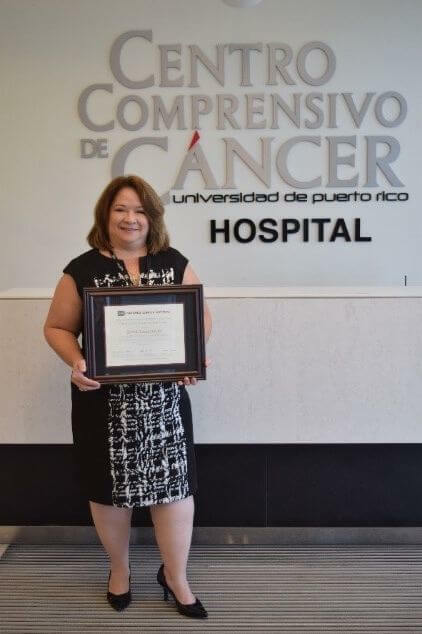 Doris E. Cuadrado, BS, Puerto Rico Minority Underserved NCORP, holding the Outstanding Administrator Award. Kandie Dempsey, DBA, MS, RN, OCN of the Delaware/Christiana Care NCORP, on the left, with NCORP Director Worta McCaskill-Stevens. 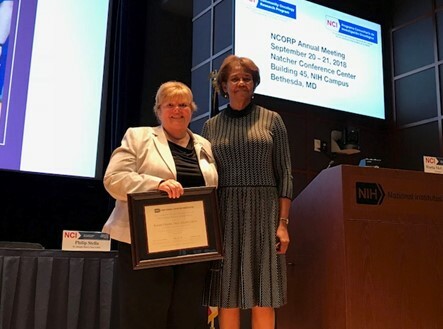 The 2018 annual meeting of the NCI Community Oncology Research Network (NCORP) grantees in late September was a banner year for recognition in the community-based research network. The NCORP’s most prestigious award, the Harry Hynes Award for outstanding contributions to clinical trials and community research, for the first time was presented to a woman investigator, Anne-Marie R. Langevin, MD, of the South Texas Pediatric Minority Underserved NCORP. Outstanding Administrator Awards were presented to: Doris E. Cuadrado, BS, of the Puerto Rico Minority Underserved NCORP, and Kandie Dempsey, DBA, MS, RN, OCN of the Delaware/Christiana Care NCORP. A total of 81 Physician and NCORP Site Accrual Awards were given based on accruals to NCI treatment and cancer control clinical trials between August 1, 2017 and June 30, 2018. They included the four top accruing physicians to cancer control studies: Kendrith Rowland, MD, Carle Cancer Center NCORP; Kinsey Pillsbury, MD, Nevada NCORP; Howard Zaren, MD, Georgia NCORP; and Amy Curtis, MD, Southeast Clinical Oncology Research Consortium NCORP. The top four accruing physicians to treatment trials were: Adedayo Onitilo, MD, Wisconsin NCORP; Shamsuddin Virani, MD, Aurora NCORP; Vinod Gidvani-Diaz, MD, South Texas Pediatric MU NCORP; and Ursa Brown-Glaberman, MD, New Mexico MU NCORP. Retirement recognitions went to: Marilyn Bauer, BSN, Med, MHA, Cancer Research for the Ozarks; Louis Fehrenbacher, MD, Kaiser Permananente NCORP; Jeffrey K. Giguere, MD, NCORP of the Carolinas; Virginia McMahon, BA, University of Hawaii Minority/Underserved NCORP; Lori Megherian, BS, MFA, Northwell Health NCORP; James L. Wade III, MD, Heartland Cancer Research NCORP; and Donald Lawrence Wickerham, MD, NRG Oncology. Platinum Award winners achieved more than 40 accruals during the period. They were: Kelly McAleese, MD, Colorado Cancer Research Program NCORP; Sara Gavenonis, MD, Delaware/Christiana Care NCORP; James Wade, MD, Heartland Cancer Research NCORP; and Steven Jensen, MD, Catholic Health Initiatives NCORP. Gold Award winners achieved 20-39 accruals during the period. They were: Monica Froicu, MD, Geisinger Cancer Institute NCORP; Jacqueline Holt, MD, Delaware/Christiana Care NCORP; Mary Hackney, MD, VCU Massey Cancer Center Minority Underserved NCORP; Sunil Nagpal, MD, Cancer Research Consortium of West Michigan NCORP; Jonathan Locke, MD, Heartland Cancer Research NCORP; Anthony Jaslowski, MD, Wisconsin NCORP; Amy Vander Woude, MD, Cancer Research Consortium of West Michigan NCORP; Maria Grosse-Perdekamp, MD, Carle Cancer Center NCORP; Evelyn Gayden, MD, Baptist Memorial Health Care/Mid-South Minority Underserved NCORP; Robert Behrens, MD, Iowa-Wide Oncology Research Coalition NCORP; Jamie Caughran, MD, Cancer Research Consortium of West Michigan NCORP; Kathleen Yost, MD, Cancer Research Consortium of West Michigan NCORP; Wade Kyono, MD, Hawaii Minority Underserved NCORP; Alan Lyss, MD, Heartland Cancer Research NCORP; Della Makower, MD, Montefiore Minority Underserved NCORP; and Dag Pavic, MD, Medical University of South Carolina Minority Underserved NCORP. Silver Physician Award winners achieved more than 10-19 accruals during the period. They included: Michaela Tsai, MD, Metro Minnesota Community Oncology Research Consortium NCORP; Bret Friday, MD, Essentia Health NCORP; Joseph Sparano, MD, Montefiore Minority Underserved NCORP; Kurt Oettel, MD, Wisconsin NCORP; Adam Raben, MD, Delaware/Christiana Care NCORP; James Ruiz, MD, Gulf South Minority Underserved NCORP; Jonathan Cho, MD, Hawaii Minority Underserved NCORP; Alice Lee, MD, Columbia University Minority Underserved NCORP; Frank Brescia, MD, Medical University of South Carolina Minority Underserved NCORP; Mehmet Copur, MD, Catholic Health Initiatives NCORP; Nisarg Desai, MD, Delaware/Christiana Care NCORP; Judith Hopkins, MD, Southeast Clinical Oncology Research Consortium NCORP; Jijun (Jane) Liu, MD, Heartland Cancer Research NCORP; Rajesh Bajaj, MD, Southeast Clinical Oncology Research Consortium NCORP; Jeffrey Berenberg, MD, Hawaii Minority Underserved NCORP; Jon Brandt, MD, Wisconsin NCORP; Brian Burnette, MD, Wisconsin NCORP; William Irvin, MD, Southeast Clinical Oncology Research Consortium NCORP; Raymond Osarogiagbon, MD, Baptist Memorial Health Care/Mid-South MU NCORP; Thomas Bradley, MD, Northwell Health NCORP; Jay Carlson, DO, Cancer Research for the Ozarks NCORP; Benjamin Esparaz, MD, Heartland Cancer Research NCORP; Bryan Faller, MD, Heartland Cancer Research NCORP; Carla Golden, MD, Bay Area Tumor Institute NCORP; David Marshall, MD, Medical University of South Carolina Minority Underserved NCORP; and Louis Potters, MD, Northwell Health NCORP. Silver Physician Award winners also included: Harold Yoon, MD, Heartland Cancer Research NCORP; Mitchell Berger, MD, Cancer Research Consortium of West Michigan NCORP; Sigurdur Bodvarsson, MD, Wisconsin NCORP; Gary Deutsch, MD, Northwell Health NCORP; Jeffrey Giguere, MD, NCORP of the Carolinas NCORP; Erin Macrae, MD, Columbus NCORP; Rubina Qamar, MD, Aurora NCORP; Gilberto Rodrigues, MD, Aurora NCORP; Ralph Wynn, MD, Columbia University Minority Underserved NCORP; Jared Acoba, MD, Hawaii Minority Underserved NCORP; Tareq Al Baghdadi, MD, Michigan Cancer Research Consortium NCORP; Suzanne Cole, MD, Cancer Research for the Ozarks NCORP; Jessie Gills, MD, Gulf South Minority Underserved NCORP; Robin Hanson, MD, Cancer Research for the Ozarks NCORP; Jagadeesh Ramdas, MD, Geisinger Cancer Institute NCORP; Gordon Srkalovic, MD, Michigan Cancer Research Consortium NCORP; Mario Velasco, MD, Heartland Cancer Research NCORP; Ronald Yanagihara, MD, Hawaii Minority Underserved NCORP; Brandy Box-Noriega, MD, Kaiser Permanente NCORP; Gary Burton, MD, Gulf South Minority Underserved NCORP; Puneet Cheema, MD, Metro Minnesota Community Oncology Research Consortium NCORP; William Edenfield, MD, NCORP of the Carolinas NCORP; Vincent Giusti, MD, Florida Pediatric NCORP; Judie Goodman, DO, Michigan Cancer Research Consortium NCORP; Sebastian Kairouz, MD, Heartland Cancer Research NCORP; David King, MD, Metro Minnesota Community Oncology Research Consortium NCORP; and Ryan Matthew, MD, Wisconsin NCORP. Awards were also bestowed on NCORP Sites for overall accrual to cancer control and treatment trials between August 1, 2017 and June 30, 2018. Platinum Awards for more than 115 accruals during the period went to: Aurora NCORP; Cancer Research Consortium of West Michigan NCORP; Carle Cancer Center NCORP; Colorado Cancer Research Program NCORP; Delaware/Christiana Care NCORP; Georgia NCORP; Hawaii Minority Underserved NCORP; Heartland Cancer Research NCORP; Kaiser Permanente NCORP; Metro Minnesota Community Oncology Research Consortium NCORP; Michigan Cancer Research Consortium NCORP; Nevada Cancer Research Foundation NCORP; New Mexico Minority Underserved NCORP; Southeast Clinical Oncology Research Consortium NCORP; Wichita NCORP; and Wisconsin NCORP. Gold Awards for 50-114 accruals during the period went to: Baptist Memorial Health Care/Mid-South Minority Underserved NCORP; Cancer Research for the Ozarks NCORP; Catholic Health Initiatives NCORP; Columbus NCORP; Dayton NCORP; Florida Pediatric NCORP; Geisinger Cancer Institute NCORP; Gulf South Minority Underserved NCORP; Iowa-Wide Oncology Research Coalition NCORP; Medical University of South Carolina Minority Underserved NCORP; Montefiore Minority Underserved NCORP; NCORP of the Carolinas NCORP; Northwell Health NCORP; Northwest NCORP; Pacific Cancer Research Consortium NCORP; Sanford NCORP of the North Central Plains; South Texas Pediatric Minority Underserved NCORP; and VCU Massey Cancer Center Minority Underserved NCORP. Silver Awards for those sites with 10 - 49 accruals during the period went to: Bay Area Tumor Institute NCORP; Beaumont NCORP; Columbia University Minority Underserved NCORP; Essentia Health NCORP; Georgia Cares Minority Underserved NCORP; Kansas City NCORP; Main Line Health NCORP; Montana Cancer Consortium NCORP; Nemours NCORP; Ochsner NCORP; Puerto Rico Minority Underserved NCORP; and Stroger Hospital of Cook County Minority Underserved NCORP.